So it’s funny, that even though I am a huge advocate and champion of Rainbows, I have never, up until now created an actual rainbow drawing that became a print. But this time, after releasing “Palm” on army colored fabric, I really wanted to swing things back in a classic JL direction, but do it with a twist. Printing actual rainbows while new to us wasn’t that exciting, even though it proved to be a challenging project. The rainbows just needed that extra layer, the graphic detail— something geometrical, but still organic. I think the Tiare flower provides that perfect balance. This collection is definitely one of my favorites, if not THE favorite. All of the prints we make are done on such a micro scale that we can say each one is different from the next. This is epitomized even more with this collection. Kellie created an amazing plethora of unique and beautiful rainbows, each one even more lovely than the next. I was literally going crazy, and could not concentrate as she was printing them— I would walk by her table and just stare. The Tiare rainbow collection comes in two different styles: The regular slouchy cross-body and the slim cross-body. They are printed in many different combinations of colors, but the top print comes in one of four colors: blue, pink, gold or white. The backs of both style bags, and the bottom of the slouchy cross-body are sewn in denim for a classic look. And to take things over the top, Nicole from Notted Nest has continued her strap-making streak (check out the bags she worked on with Love + Monsters) and collaborated with us to make 2 amazing macrame add-on strap options: Flat and Spiral. 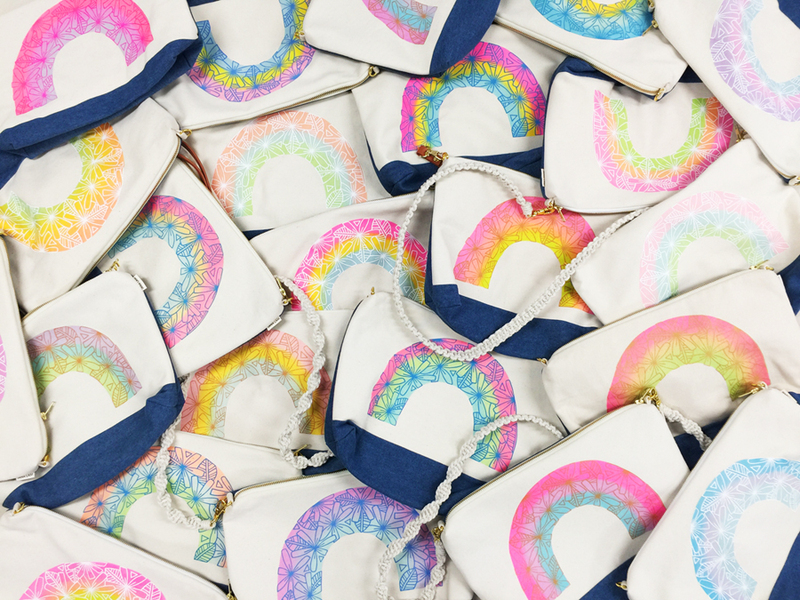 The Tiare Rainbow Collection will be available for purchase online and in the JANA LAM shop on Saturday, July 14th. If you can make it to us on that day, don’t miss it because there is only one of each of many of these rainbows and once they are gone they are gone. I really hope you LOVE this collection as much as I do, I am so SO SO happy to present it to you. Jana Lam is a Honolulu, Hawaii based design company that focuses on products and accessories for an endless summer. Lam's beach front home once served as the production house of her handmade in Hawaii line of one-of-a-kind, hand-printed and sewn apparel and home accessories. In Fall 2017, printing and production move out of the home studio, and the Jana Lam Studio + Shop was opened in Kaka'ako.